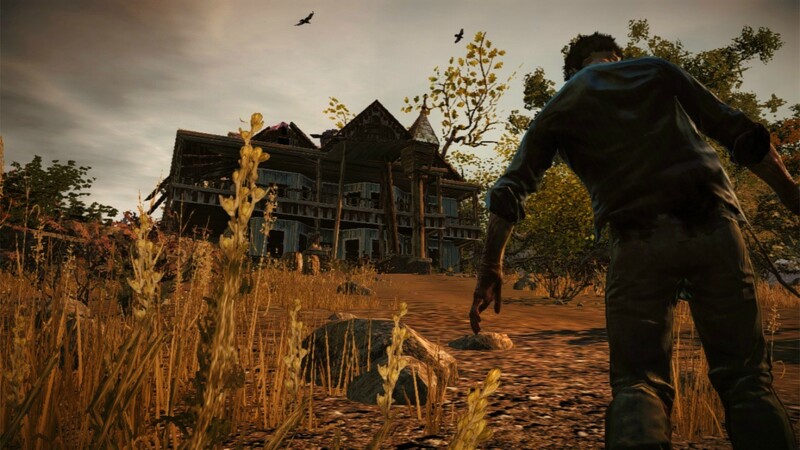 State of Decay is likely one of the biggest Xbox Live Arcade titles to release in a long time. The fact that its published by Microsoft tells you that it's going to be a very high quality game. It's an open world zombie survival game, which continues to live and breathe even when you aren't playing. If you don't help your characters to survive, they'll die. And death in State of Decay really does mean the end, no respawns or anything like that. You need to look after your fellow survivors, as it's so much harder to go it alone. It's an ambitious project, but with Microsoft's backing, have Undead Labs pulled it off? Read on to find out! You start the game in a beautiful wooded area, next to a gorgeous lake and nearing a camp site. Initially you play as Marcus, just a guy who wanted to enjoy a camping trip with his buddy Ed, unaware of the impending zombie apocalypse. Before you know it, you're thrown into a fight with a few zombies, and you get to try out the combat, which is very cool, and very graphic. As you start the game with a friend, you get the feeling that you will always have an ally with you, but this is not the cause. The game would be much more interesting if you could choose a partner to take, each with different abilities. Another improvement in that department would have been online cooperative play. It's a game that would completely suit an online mode, but hopefully Undead Labs will remedy this. When playing the game, you'll spend a lot of your time scavenging. You need to be constantly bringing back supplies, food and building materials to your base, so not only are you well stocked with ammo and weapons, but your allies morale will be significantly higher. Keeping this up is key, as low morale can lead to characters being depressed, and some will even take it as far as suicide. This repetition would be annoying in any other game, but this is a zombie apocalypse, if you don't do this, you simply won't survive. It works completely perfectly, and it never gets boring. Raiding houses is so tense, you never know if there'll be a zombie waiting in the next room for you, and sometimes there won't be any supplies to find. When you do find a full load of supplies, you genuinely feel a sense of relief and happiness, and taking it back to your allies is an incredibly satisfying experience. There are so many melee weapons to lodge into zombies' skulls, and each one has a different size and weight that affects how your character can handle it; heavy weapons are slow but more powerful, whilst light weapons allow you to swing much faster. They also take damage every time you hit an enemy, which greatly affects their attack power, but as you progress you'll be able to build a workbench, on which you can repair them. There are also a great number of ranged weapons, from pistols and revolvers to shotguns and SMGs, but these should be saved for desperate times, as the loud gunshots will attract zombies. Actions such as boarding up windows and searching for items create noise, and any zombies in the vicinity will come to investigate the cause. If you can manage to sneak behind a zombie, you can initiate a lethal takedown, which instantly kills them. There are a lot of ways to arm yourself for the apocalypse, so you really can play the game exactly as you want to, though with ammunition low and weapons constantly breaking, you may want to use stealth. 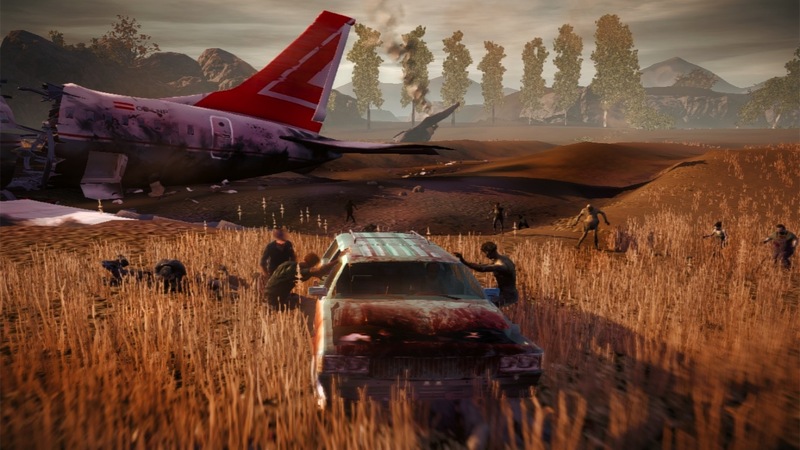 State of Decay has a feature that has been done before, but never quite like this. The world continues to turn, even when the game is off. It works just like real time, so if you didn't play the game for a couple of months, upon your return you will find that people have died, rations will have run out, and your barricades will have been broken down. Whilst it's definitely a cool feature, it also feels like you're being punished simply for not playing the game. If you don't have time to play for a week or two, then you have to spend more time regathering supplies that you already had the last time you played, it could put you off going back to the game. The world of State of Decay is seriously huge, it's probably one of the biggest open worlds in any Xbox Live Arcade title. There are lakes, towns, farms and forests, and they all work together really well to create a realistic world. To traverse the huge world of the game is quite an intimidating task, but there are a good variety of vehicles to speed up the journey. Unfortunately, the cars handle poorly, and some of the more sporty cars are simply too fast. It's just too easy to crash your car, and considering that your cars take damage and eventually break down, you would have thought that Undead Labs would have worked more on the car handling. The graphics are damn impressive too, from the characters to the vehicles to the landscape, the standard of visuals is incredibly high across the board. There are some niggling graphical issues, such as pop-in, which is literally constantly happening. Grass and objects like mailboxes, signs and fences just appear slightly ahead of you, and when you're driving a car it's impossible not to notice. There were also a few times where the screen got filled with small white lines. It only happens for a split second, so if it was a one-time thing, it would not be too bad, but it happens usually once per session. State of Decay is an amazing amalgamation of genres: action, RPG, survival horror and open world. You'll get sucked into the world and you'll want to look after the survivors that you rescue and get to know. The fact that they can die if you stay away for too long ensures that you'll keep returning to the game, and each time you'll have a different experience. Infestations and hordes are constantly shifting and moving around the map, and random missions are always occurring. There are some issues (graphical glitches, lack of co-op), but some of these can be fixed in an update. If you have time to play this at least every couple of days, and don't mind that it is currently single player only, it is most definitely worth getting. It costs 1600 Microsoft Points, which is a lot for a digital title, but the production values and overall quality of the game make it completely worth it.